So my parents just left yesterday. I am super close with them and my heart actually hurts today. It feels like something is missing. Driving the 15 minutes to Maria’s school this morning, I missed my dad because he came with me to drop her off each day. We chatted and laughed the whole way. And this morning when I had my first cup of coffee I thought about my mom who swooned every morning at our house when she smelled that pot of Costa Rican coffee brewing (that lady loves her coffee). I went to daily mass this morning and everyone around me was singing (I lip synched since I did not know the words). The music really got to me and I started crying because I miss my parents so much already. Well, I guess that’s a good thing because it shows how much I love them and how much fun we had during their two week stay here in Costa Rica. Their trip started out with adventure because we were late picking my parents up at the airport. The mystery mobile had a flat tire and we had to ask a local taxi cab driver to help us out. 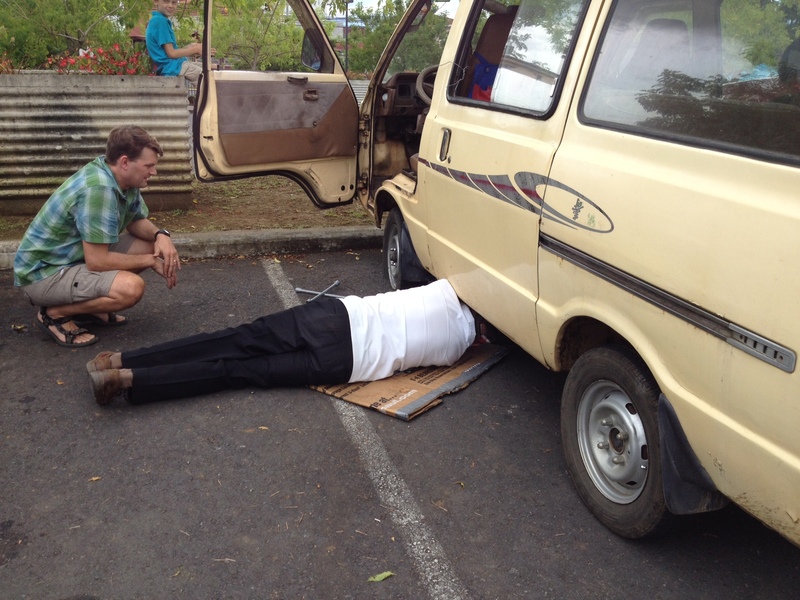 Here in Costa Rica taxi cab drivers aren’t just drivers, they are jacks of all trades. We hired this gentleman to take Marc and the tire to a tire repair shop. Since we hired him for an hour, he did all the work. He would not let Marc take the tire off. When Marc and the cab driver got to the repair shop, it was closed for lunch (shops close all the time here for lunch). So Marc and the cab driver sat for 40 minutes on a bench outside the tire shop until the owner came back. Luckily my parents flew to Costa Rica with their friend Martha Tipton who lives in my hometown Marietta, Ohio. Martha’s sister, Jean, lives in Atenas, Costa Rica (where we used to live) so Jean and her husband Bill were already at the airport. I called Jean, told her the scoop, and she informed my parents that we would be running a tad late. Phew. We always build in a buffer for time when we are driving here in Costa Rica since there is a high likelihood of something breaking, so we ended up only being 15 minutes late. As soon as we arrived at our house, it was time for chips, salsa, cerveza, and fruit picking. Day #2 we were up early. We dropped Maria off at preschool and headed straight to Atenas to meet up with Mrs. Tipton, Jean, and Bill at the El Toledo Coffee Farm. I highly recommend anyone visiting Costa Rica to make a stop here. I think it is my favorite place I’ve visited in Costa Rica. Gabriel as always did a fantastic job leading the tour. Next up was the Poas Volcano which I wrote about on the last post. It was Joellen’s birthday which made it extra special. Poas is an active volcano. While there is no spewing lava, there is quite a bit of sulfuric steam coming out of it. There was a sign that said visitors should only stay for 20 minutes because of breathing in the sulfur gases. We stayed there for about 45 minutes…oops. We took my parents to the La Paz Waterfall Gardens. My parents really enjoyed the waterfalls, the hummingbirds, and the toucans. I think I took 100 photos of the hummingbirds. It was crazy how many there were and how they would sit still in the trees. Back in 1998 my parents and brother came over Christmas to visit me in San Jose when I was living here in Costa Rica. One of the best parts of that visit was when we went to a Costa Rican bullfight. Really it’s more of a bull tease because the bull is not harmed and a bunch of local drunk guys get in the ring and taunt the bull. So my dad has been telling me for months that he really wanted to see a bullfight on this trip also. Well, I could not find one for the time period my parents were going to be here in Costa Rica. But lo and behold on the way to Maria’s school one morning, we spotted a small poster advertising a local bullfight in the little neighborhood near Maria’s school. We couldn’t believe it! So off to the bullfight we went. Even though it was a much smaller scale than the one in San Jose over Christmas, it did not disappoint. There were even 3 guys called the “Super Amigos” that got out in the ring and did a choreographed dance routine to “Gangnam Style”. At the event there were also souped up bumper cars that were turned up full throttle. My dad said there was no way the speed of these bumper cars would be legal in the US. After a few strong jolts that launched Joellen on the floor of her bumper car, my dad discovered there were makeshift seatbelts. My dad rated this evening an A+ while my mom gave it a solid C. For those of you that know my parents, their ratings probably do not surprise you. We had a wild and crazy time at the orphanage. Luckily Cherie is super chill and that is good since we almost lit her house and her neighbor’s house on fire! OK, let me start from the beginning. We started off with an egg drop contest. We split all the kids up into pairs. The kids drew numbers to see who they would be partnered with. Joellen has become best friends with Esmeralda, so they screamed and jumped up and down when they found out they were paired up together. Each pair of kids received the same bag of “stuff” to use in their egg drop contraption. The goal was to protect your egg so that when Marc dropped it from the roof, it would not break. We gave each team materials such as toilet paper, egg cartons, string, pom pom balls, etc. I think we gave each team too much material because no team’s egg cracked. But boy did the kids all have fun. They were so hyped up during the egg drop that I’m sure all the screaming woke up any sleeping babies in the neighborhood. 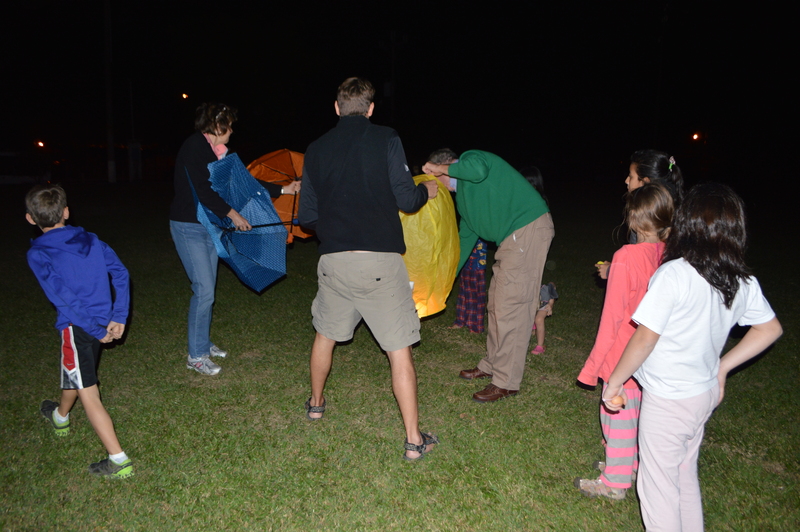 Next up was lighting and sending two sky lanterns up into the air. (We did this earlier in the week at our house for Joellen’s birthday. The day after Joellen’s birthday there was talk all over the Grecia, Costa Rica Facebook page of a UFO sighting. Turns out it was just our sky lantern. What a hoot!) My parents brought 3 sky lanterns to Costa Rica in their luggage. One for Joellen’s birthday and two for the orphanage. Cherie and I had the brilliant idea to light the sky lanterns from the roof and have all the kids come out and watch. OK, it looks dangerous but it was not. Cherie’s roof slopes down and connects with the neighbor’s roof. So even if a kid tumbled, they would not go far. It was windy on the rooftop and the orphanage is up a mountain at a high elevation here in Grecia. So those two factors caused my dad to have a hard time lighting the sky lantern and getting it to take off. Marc and my dad finally got it going but as soon as it started to go up in the air, it started to fall and it landed in a neighbor’s yard. We all panicked because this thing was lit! Marc carefully pranced/ran across the roof to the edge where the lantern went down. Marc looked down, only to discover the neighbor coming out of his house in nothing but tighty whities! Marc was at a loss for words so waved and said, “Hola!” The neighbor was now the one prancing around in his undies trying to not get burned by the lantern’s candles and also trying to get it to fill with air. The neighbor got the lantern going and helped it into the air. But it got worse! The lantern floated into the electrical lines and caught on fire! Holy guacamole this was NO BUENO! Cherie of course remained calm as a cucumber and simply told all the kids to stay away from the flaming ball on the electrical lines. Yikes! Somehow by the grace of God, the lantern fell out of the electrical lines and again fell to the ground. Marc peered over the roof again and this time informed us that luckily the lantern burned out. Cherie thought for sure she was going to lose electricity for a week or two. Luckily no electrical damage. Crisis averted! One sky lantern at the orphanage down, one to go. My dad suggested we find a place more in the open, away from electrical lines. Not a bad idea. So Cherie exclaimed, “Let’s go to the soccer field!” So we all piled in cars and headed a kilometer down the mountain to the soccer field near Cherie’s kids’ school. There was much more space here and we used umbrellas to block the wind so we could get the sky lantern lit. Again it was hard to get it up in the air because of the high elevation. It went up and down a few times but it finally took off and floated up into the air. By this point we had a small crowd of locals watching and we all cheered together. While the coffee tour and the orphanage were absolute highlights for my parents, they also really enjoyed just relaxing at our house. We cooked a lot of Costa Rican food together, my parents helped with homeschooling, and they did lots of bird watching. Luckily my parents brought their good binoculars from home because we even had a toucan sighting at our house! Thanks Mom and Dad (Mimi and Jaybird) for visiting us and participating in all the crazy shenanigans. As much as you kept telling us how much fun you were having, we felt even more so. Thanks for coming to visit to be part of our life here in Costa Rica. Update on our travel plans: We are staying in Costa Rica for one more month. January 7 we fly back to Florida and get back on the boat. Oh, and lots of runs to Costco to stock up on canned goods and diapers. ← Muy Bien…Joellen is Ten! Love reading about your adventures!! It’s wonderful that your parents got to come and visit as well! Have a beautiful Christmas and safe & happy new year!! It’s cold, gray and windy near Dayton, Ohio, so enjoy that warm sun for me. Jen – Loved your blog – so envious of your adventures :> What fun – still am thinking of Costa Rica – just haven’t been lead to what I should do but it will come!! Have an enjoyable last month – give hugs to all! So fun to hear from you. That was great seeing you at Cherry Tree!!! You will love Costa Rica. I can’t recommend Grecia enough! We love it here. Jen, as so many have noted: your stories and words are enjoyable to read, but the pictures just keep getting better and better… We were lucky to spend Thanksgiving with all 3 girls and Aunt Kelly & family. Thank you so much. I just love writing this blog and I’m so glad we’ll have this to look back on. But I’m so glad that others like you are enjoying it too. We’ve told you before, but you are the main reason Marc got into “adventuring”. Once he started, he got hooked. So thanks. So glad all 3 of your girls were back for Thanksgiving. They are each amazing. HILARIOUS !!! I can just see Marc jumping off the roof to snag the sky lantern !! The kids on the roof- wow ! They’ll never forget that experience! Good idea, Jaybird- soccer field. Must commend you all on ” never give up”. Your photos continue to amaze me,Jen! Definitely a coffee table book down the road. Know how much fun you all had & how blessed we all are to be able to share your adventures. Look forward to your next blog, FaceTime & seeing you in January ! Hugs to all ! Te amo….Nana & Papa 😄🎄. PS Best regards to ” the mystery mobile” still going- amazing…. Thank you so much. Your words are so very kind. We really have this blog as a written record of our trip so Marc, the kids, and I can remember it in years to come. But I’m so pleased that others are enjoying it too. I can’t believe the blog has touched you. That means the world to me. Marc has told me about you and about what an amazing person you are. He has a lot of respect for you. We will be back in Indy next May or June and would love to get together with you. God bless you this Advent and Christmas season. Keep in touch. Wow, you guys had a lot of adventure while your parents were here! I agree that Gabriel and family and their El Toledo Tour is something very unique and special. I love seeing Gabriel’s smile at the Grecia farmer’s market… he lets my kids stand on the booth and grind coffee beans, which they love. Hi friend. I feel like someone famous just commented on my blog!!!! Travel Mother commented!!! Can’t wait to learn some blog tips from you next week. Pura Vida.